I took the VCAP5-DTD beta exam on January 3rd, 2013. Like many people, I received the welcome news today that I passed the exam. I’m laughing a little to myself as I write this post because my certification folder contains a log of my studying. 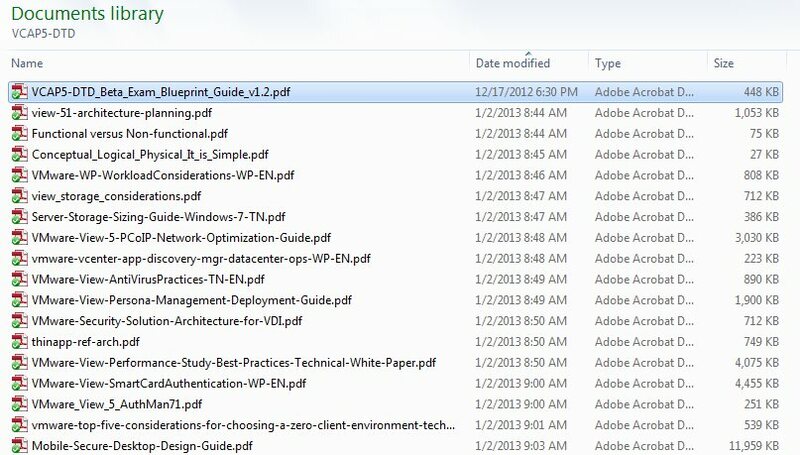 I downloaded the beta blueprint on December 17, 2012, but I already had Microsoft exams scheduled for December 28th. I did no studying for this VCAP until the day before the exam, January 2rd, where you can clearly see my feverish morning download activity. I will say though that I have several years of View deployments under my belt, so my knowledge on the engineering side was up-to-date and at the front of my mind. I downloaded every PDF referenced in the exam blueprint, and I already had most of the product documentation already downloaded. I am primarily a delivery engineer, but to be successful on the exam you need to put on your designer’s hat. I tried to keep that in mind as I pored through the PDFs – it does make a difference because different information will stand out if you actively look for design elements. My exam was just after lunch and it was well over an hour away, so I left early and brought my Kindle. I continued going through the PDFs until exam time. The sheer volume of information you have to read through makes VMware design exams quite difficult. I suggest reading the answers before you read the question – this helps you identify clues in the question. There are detailed descriptions requiring 6 or more paragraphs of reading just to answer a single multiple choice question. The GA version of the exam has 115 questions and 6 diagramming scenarios. Keep track of the number of diagramming questions you get so you can budget your time appropriately. You should not spend any more than 15 minutes on a diagram. Keep in mind that 15 * 6 = 90 minutes, leaving you only 105 minutes to answer 109 questions. The pace you have to sustain is mentally exhausting. The beta was even more difficult with 131 questions, plus the expectation to provide comment feedback on the questions. I found the diagramming questions to be even more involved than the DCD questions.. I’d say the tool was a bit better behaved than the DCD exam, but not by much. It’s easy to get sucked in to a design scenario and waste far too much time. Remember that you’re not designing the perfect system, it just has to be good enough to meet the stated requirements. This entry was posted in Certification, VMware and tagged certification, vcap, VCAP-DTD, VMware by pkremer. Bookmark the permalink.